Lawrence honed his blacksmithing skills forging tongs for his logging operation. The tongs were used to hook logs in the forests of northern Idaho. "After retiring I have turned my forging talents into creating decorative iron work. Along with iron work I combine it with unique wood pieces to make tables, lamps, pedestals, lamps, etc." 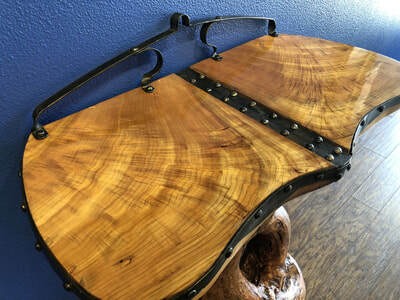 Lawrence has been selling his works under North Idaho Wood-n-Iron through our gallery. He has also participated in our annual Miniatures by the Lake show. All Lawrence's pieces are one of a kind, completely handmade. He often does special order items that have included: outdoor - tables, copper piling caps, wood and iron railings; indoor - tables, lamps and candle holders. He works with various types of wood and often creates pieces based on inspiration from the wood grain and shape. Lawrence is a North Idaho native, residing in Rose Lake, Idaho since his birth in 1937.